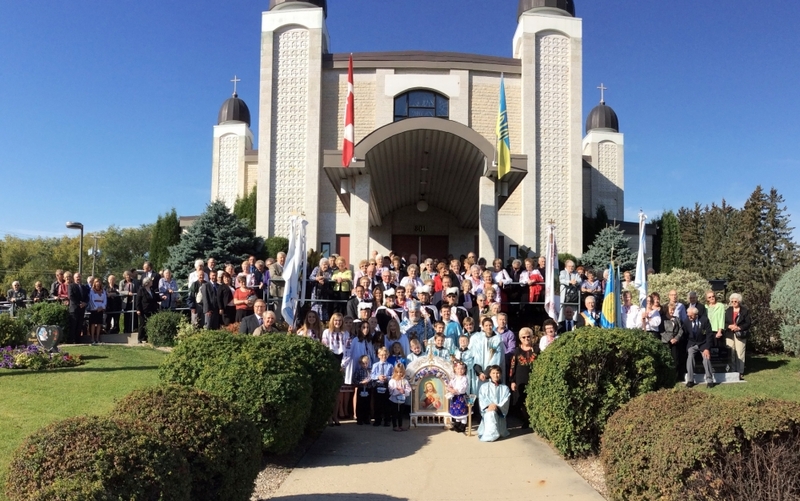 The Ukrainian Greek Catholic Church of the Resurrection in Dauphin celebrated its 100th anniversary of the Parish on Sunday, October 2, 2016. Briefly in history: The Parish was founded in 1916 when the first few Ukrainian families who settled in Dauphin, got together to celebrate a Divine Liturgy in one of the pioneer homes. Father N. Kryzhanowsky celebrated that first Liturgy. When more families arrived, the pioneers purchased an Anglican Church, remodeled it to the Eastern Rite and made it a home for their Parish. As the membership grew so did the need for a more accommodating church and in 1936 the new prairie cathedral, designed by the renowned architect Father Philip Ruh, was opened on the same site as the first church. Through the years the church became overcrowded and lacked the amenities necessary for its near 600 members. It remained in operation until 1991 when the present church on Jackson Street was officially consecrated and a first Divine Liturgy celebrated on October 6 of that year. The priests serving this parish up to 1959 were: Fathers Olenchuk, Pelech, Roberecki, Syrnyk, Shumay, and Tepley. Msgr. Mitrat Gregory Oucharyk was the pastor from 1959 to 1994, followed by Msgr. Michael Buyachok from 1994 to 2005. Serving the parish from 2005 to the present, is the Very Reverend Father Oleg Bodnarski. The Historic church remains as a unique landmark in the South end of Dauphin. A small committee with the help of the Parish, some fundraising, donations and some Government funding works at preserving this amazing architecture and interior. It has been designated as a provincial and federal historic site hosting many tour groups and visitors from Canada, the United States and many other parts of the world. The parish itself has many organizations such as the Women’s League, The Brotherhood, Children of Mary, Altar Servers, Catechism and Youth groups, Choir, Pastoral Care, Sisterhood, Prayer Groups, Kitchen Food Services, Elders, Ushers, Knights of Columbus and Parish Council. The Resurrection Parish was honoured by many distinguished visitors in the past years. The most recent was His Beatitude Sviatoslav Shevchuk from Ukraine who is the head of all Ukrainian Greek Catholics world wide. Besides many Canadian Metropolitans and Bishops, this parish has also hosted Archbishop Bukatko from Yugoslavia, Bishop Confessor Velychkovsky and Bishop Malanchuk from France, Bishop Peter Stasiuk from Australia, His Emminence Cardinal Joseph Slipey and Cardinal Myroslaw Lubachivsky. The celebratory Anniversary day began with a procession with the Honour Guard of the 4th Degree Knights of Columbus, Clergy, Children, Altar Servers and banner and flag bearers proceeding to the main entrance. The Head of all Ukrainian Catholics in Canada, His Grace Metropolitan Lawrence Huculak was greeted with the traditional Ukrainian greeting of bread and salt. These were presented to His Grace by the Ukrainian Catholic Women’s League president, Shirley Novalkowsi and the Ukrainian Catholic Brotherhood president, Ed Smaluk. The procession then proceeded to the Altar while the choir sang an appropriate hymn. During the mid point of the Divine Liturgy His Grace, in his Homily, spoke of the challenges our pioneers faced as they came to this new land 100 years ago. He also spoke of the challenges we face at the present time in our high - paced technological world where many lose focus of what is truly important in our lives. The Divine Liturgy was celebrated by His Grace, Metropolitan Huculak and the Very Reverend Father Oleg Bodnarski. Following the Liturgy, His Grace did the water blessing as is traditionally done on church feast days. He also blessed the two new stained glass windows on the balcony which now completed all the windows on the upper level. This was followed by a procession around the church by all present, stopping at the newly erected monument dedicated to the centennial of the Parish that was jointly sponsored by the Ukrainian Catholic Brotherhood and the Ukrainian Catholic Women’s League of Dauphin. This monument was also blessed by His Grace after a brief ceremonial service. A group picture of all in attendance was taken on the front steps of the church. As everyone came down to the auditorium to enjoy a catered banquet, they were greeted with musical entertainment by Marvin & Mary Procyshyn accompanied by Manuel Nakonechny. As the Head Table guests were introduced, they made their entrance to a hymn sung by the church choir. Alyssa Kristjanson and Owen Tyschinski presented flowers to his Grace. The choir sang The Lord's Prayer and His Grace offered a blessing of the food. Congratulatory messages were read from former church members and local dignitaries. Greetings were presented by Parish Council Chairperson Mr. Ernie Sirski, City of Dauphin Deputy Mayor, Mr.Al Dowhan and the Parish Pastor, the Very Reverend Father Oleg Bodnarski. Mary Procyshyn presented a historical overview of the past 100 years. Effie Ozechowski received a bouquet of flowers for being the oldest member (102 years) of the Parish. During the banquet an on-going video presented the life in our parish through the years. We thank Father Oleg for his time and his help in scanning the hundreds of photos that were submitted or available in our archives. The afternoon concluded with a song by the Catechism children, a centennial tribute poem by Kay Slobodzian and three novelty musical selections by Marvin, Mary & Manuel. Masters of Ceremony for the banquet, Ernie Sirski and Tere Stykalo acknowledged all who attended or participated and all those who worked to ensure the success of the celebration. We thank Shirley Novalkowski and her helpers for the many hours spent going through all the archival material available and putting together the display for the celebration. This will remain on display for most of the year. Anyone visiting our auditorium is welcome to view this historical and informative presentation of documents and photos.